The DanceAbility Teacher Certification course is an intensive training designed for people to become inclusive dance teachers. Participants who complete the course will obtain the DanceAbility Teacher Certificate. Hosted by the Centre for Community Cultural Development, the course will run in Hong Kong from 22 July to 16 August. With well-defined methods and techniques, participants will be able to facilitate dance, improvisation and movement, which also helps participants to dissolve barriers and connect people with mixed abilities by encouraging everyone to dance. Throughout the course, participants will build on their own exercises to develop appropriate materials for their own communities. During the one-month intensive program, it will cover 60 exercises with demonstration. Students of the programme would be provided a 200-page DanceAbility Manual which covers over 150 exercises with detailed descriptions. Alito Alessi is the Artistic Director of DanceAbility® International and co-founder of DanceAbility®. He has been recogniz]sed as a Guggenheim Fellow for this work and his dance company has been awarded The United States National Endowment for the Arts awards and other major recognitions. 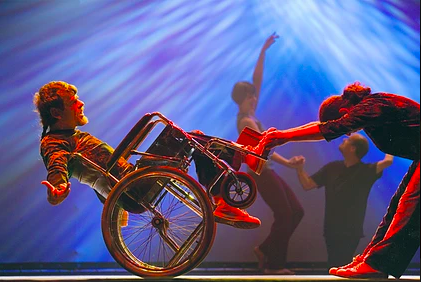 Alessi has been involved with the evolution of contemporary dance for the past 30 years, and is internationally known as a pioneering teacher and choreographer in the fields of contact improvisation, and dance and disability. Alessi was selected as a Fulbright Senior Specialist (2007), received the Hong Kong Dance Award (2007) as choreographer for the ‘DanceAbility Community Dance Project’ organised by APTFS and CCCD . In 2019, he has received the Zero Project Award on behalf of DanceAbility® International in United Nations Vienna for their efforts in promoting the development of people with different abilities. Please apply by sending your registration form and curriculum vitae to carmen@cccd.hk. If you have any further enquiries, please feel free to contact Carmen via carmen@cccd.hk or at (852) 2891 8482 (international number).